Going on instructions from King Koopa, Hip & Hop break into the Mushroomkhamen tomb and steal the prince's sarcophagus. However doing this wakes up the prince's mummified mother, and she wants her son back. 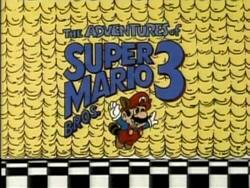 She causes an uproar in Desertland which forces Mario and friends to intervene. Things get more complicated from there and confusing as Mario and Prince Mushroomkhamen could be mistaken for twins. Making a huge mistake, Queen Mushroomkhamen forcibly takes Mario back to the tomb and acts like his mother. This allows Hip & Hop get away with the real prince. Luigi, Toad and Princess Toadstool must rectify this, but that requires a brave intrusion into Castle Koopa.